TheArmenianKitchen.com : Want to be healthy as well as calm? Eat like an Armenian! Want to be healthy as well as calm? Eat like an Armenian! It's not hard to imagine that Americans were a bit jittery in April 1918. The world was at war, and now the United States was too. The American Expeditionary Force was poised to join the fight in France, but material shortages were already being felt at home. American Cookery magazine offered plenty of advice. For those seeking nutrition in the absence of both wheat and meat, there was a recipe for nut-filled "Liberty Sandwiches" on oat bread. For those seeking relief from war-time tension, there was this: Eat like an Armenian. 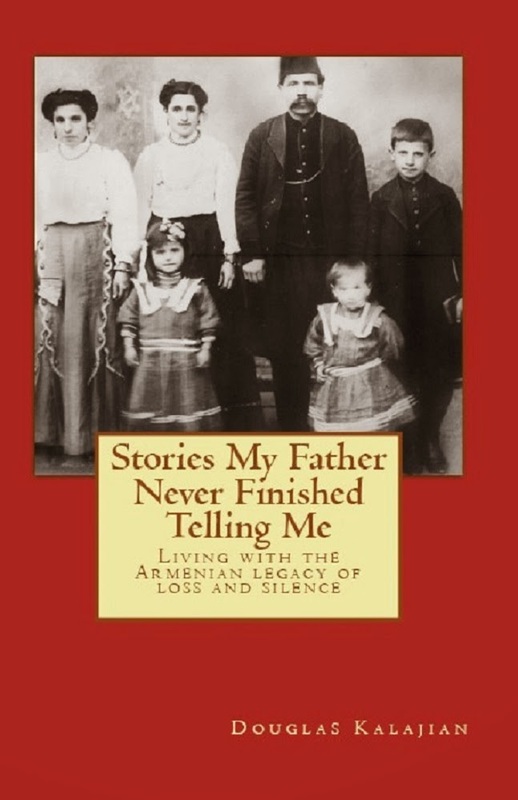 In an article titled, "The Food Habits of a People Without Nerves," Henry C. Tracy notes that Armenians "endure more than an American cares even to think of a human being enduring," yet they enjoy "exception freedom" from nervous afflictions. The merchants and tradesmen he encountered in various cities were also remarkably healthy and vigorous, despite their relatively sedentary lifestyle. 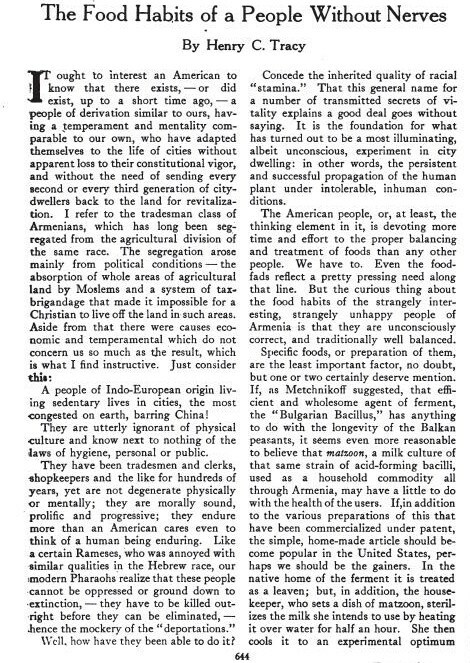 He concluded that the Armenian diet must be responsible, and that Americans would do well to emulate it. More important than specific ingredients was the "physiological soundness of the Armenian's habitual diet" that provided just the right nutritional balance. "There seems to have been acquired a national instinct for the right combination and proportions of fat, protein and carbohydrates, together with the rendering of them digestible and most assuredly appetizing." The author notes that this natural balance is not found among Americans, who even then were prone to eating all the spare ribs and potatoes they could gobble down. The Armenian diet provided a sharp contrast to "the habitual eating of twice as much of everything (from meat to sugar) as the body needs." This sounds like a remarkably contemporary observation, doesn't it? Of course, the author identified yogurt (which he called by the Armenian name "matzoon") as essential to good health. But he also zeroed-in on the Armenian love of onions, "the pungent and soothing 'lily of the vegetable garden.' "
The source of Tracy's expertise isn't noted in the magazine, but other citations indicate he was a naturalist who traveled through Asia Minor studying birds and other wildlife. 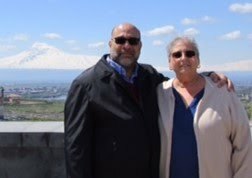 He spent enough time eating with Armenians to understand that "a fundamental tenet of the Armenian kitchen is that a meal must be appetizing as well as simple." "The word 'hamov' means literally having taste; but our word 'tasty' could never translate it." Nearly a century later, we certainly agree.